As a blogger, I receive numerous products to try out and write about. Not all of them make it on the website, some of them are obscure brands and are a big disappointment, others turn out to be the best thing ever invented and there are those that I absolutely fall in love with and continue buying myself long after the initial sample is gone. I thought I would compile a list of lesser known favorite products I have been using lately. I was sent this as an add on item to something else I was working on, just in case I happened to love it and I did. This could have been a total miss, yet it works brilliantly. You know how your house turned into a place for toys and those toys come in tiny pieces and then get dispursed and thrown around multiple times a day, so that your living or playroom resemble a trash site? Well, I do. Lexi has plenty of toys that are small sets of things, like a set of wooden animals, or egg faces or flowers… it is a nightmare to put them away. So when I am short on time and need to quickly pick up the living room, I turn to Tummy Stuffer. It’s simply a stuffed toy that has a big belly where you can store stuff. We store all our small toys in the Tummy Stuffer. And because it’s hilarious with its tongue and a big mouth, Lexi actually has fun picking up after herself and having the Unicorn “eat her toys”. This brilliant but simple invention works equally well for older kids, so they can stuff their socks and other random odds and ends into the Tummy Stuffer. Basically, anything that doesn’t have its own place goes there. You can see a video of how it works here. Some may remember our old swing cover we used here that I’ve been asked a lot about. My only one complaint about it was that it was bulky. Well, I have found a swing, shopping cart and high chair cover that solves that problem. 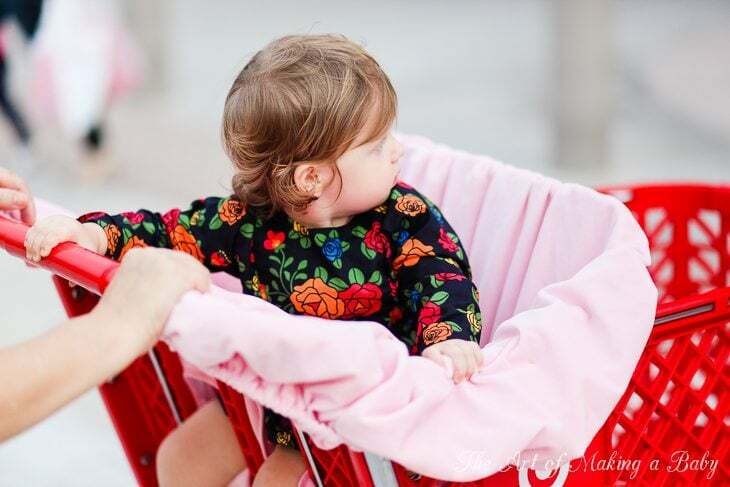 2 Red Hens, the makers of super cute diaper bags and accessories, came out with two matching products, Toy Nanny and shopping cart cover. The shopping cart/high chair cover doubles as a swing cover, though not advertised as such. It easily folds into a zip pouch that will match your 2Red Hens diaper bag and can be carried on your arm. The outside of the pouch is water-resistant which makes it a perfect high chair cover. So this product is the best example of a multi-functional and convenient item as it folds into a small pouch and works as the high chair cover, shopping cart cover and a swing cover. Another product by 2 Red Hens that is genius. I didn’t think I needed it past the sitting stage, but when we got it for the Daily Mom feature, I got to keep one and it turned out to be really useful. Toy Nanny is a mat for your baby to hang out on that has pockets to stuff toys into and handles to carry it. So you have your baby playing with her toys on the mat, then instead of taking the toys and putting them into a separate bag, you simply gather the handles and the mat turns into a bag that picks up all the toys. Super awesome for those constantly going over grandma’s or friends’ house. In our case though, we use it as a beach toy bag. The mesh pockets are perfect for sandy toys and the mat serves as protection from the hot sand. I didn’t think I would need this past 6 months of age, but it’s turning out to be a great item for toys at any age. This new Danish line of flatware for babies literally BLEW MY MIND. This is one of those products that I love so much I become an unofficial ambassador of it. I have never used a set so ergonomically perfect and of such high quality as the Toddler set. It’s like the products were designed by a toddler, specially for their small hands. I am not sure how they figured out what would be perfectly comfortable for babies, but they got it so freaking right! Apparently, they watched babies eat, they took their skills and interests into account, they played around with them, they involved them and they came up with an amazing product. I am seriously so excited about this one and it’s just a few bowls, spoons and cups that won the reddot design award…. Ok, so to describe why Toddler set is so amazing, let’s start with the material. QUALITY: Of course, they are BPA, PVC and Phthalates free. That’s almost a given. They are made of ABC and TPE which are considered safe high density plastics. And high density they are. While my Boon and Bjorn and OXO plates all have dents in them from months of use and washing in a dishwasher, this set seriously still looks like I just bought it. It’s the kind of set that can probably be passed down to generations, if the first generation is willing to give it up. It’s our favorite set we take with us when travelling, as it’s easy to clean. The inside is smooth and hard and the outside is soft and grippy, perfect for spazzy toddlers. DESIGN: This is what really makes me so excited about the set. It’s made specifically for small hands. And not “oh we resized adult cups and made them smaller” kind. The Toddler cup is the perfect size and perfect roundness that toddlers adore drinking out of it. You should see how Lexi grasps this cup versus other cups. If you have a baby who’s resistant to switching to a cup or you’re looking to teach your toddler to use cup, this is the only cup you will need. (I said cup 5 times) Yes, it’s VERY small so there isn’t going to be a ton of liquid in there, but babies don’t need much. Bigger cups are an overkill at the expense of comfort. If you take a standard sized toddler cup and have an adult use a similar sized cup adjusted to their size, we would have to be hugging a whole pitcher. How comfortable do you think it is to drink out of a pitcher all day long? Not very comfortable. The cutlery is amazing. It comes with a knife, a spoon and a fork and are once again the most comfortable utensils we have. The handle of the utensil is thick, so your baby gets to grab the whole stem and comfortably use it, since at that age they still haven’t mastered the skill of finger holding. You can see in the photos how she grips her utensils with her fingers wrapped around them. The spoon scooper is narrow but long which really helps pick up tricky food. The plates and bowls are very well designed too, show absolutely no wear after months of using them, grip extremely well on all surfaces and don’t slide around. The whole set is stackable so you can involve your toddler in setting the table. PRICE: It’s really expensive, I have to admit. But seeing the quality firsthand and how well they are holding up, it works out better in the long run. I have had to throw out many Boon/OXO/Bjorn spoons and plates after Lexi chewed the ends off of them and dented the sides or that show too much wear, but this doesn’t have a scratch on it. If money is an issue, but you really want to try this set, buy separate pieces just to see how awesome it is. Their cup is really a must for any toddler. I am such a sucker for fuzzy things. I love fuzzy socks, fuzzy blankets, fuzzy bears. I have a collection of fuzzy blankets that I use on daily basis. When ABC sent me a Luster Loft blanket and a hand stitched Baby Blanket to enjoy, I couldn’t believe the softness. Seriously, it is the softest blanket in my collection and I use it on daily basis. I have washed it a million times and it has not lost its quality: it’s still non-piling, non-shedding. It would make for a perfect gift as they come in a beautiful box with a bow, though I am not sure that I wouldn’t want to keep another one for myself. I talked a bit about Lexi playing with my hair while nursing in the Breastfeeding post. I got two nursing necklaces from Mommy’s Necklaces to help with the issue. There are several styles to choose from to wear every day as well as my favorite necklace, called Nourish Necklace (pictured) that is designed to really engage the baby. Lexi loves it more than any other necklace I’ve used and actually plays with it when not breastfeeding. Isn’t it beautiful? It’s not meant to be worn as a fashion necklace, but is specifically a wear-at-home nursing necklace. This isn’t really kid’s related, but the need for it did arise due to the fact that I carry around sippy cups that are spill-prone. I have a very expensive camera, I have dropped that camera, it’s been rained on, I’ve had water spilled on it. It was then when I had Lexi’s sippy cup spill all over my camera when I put it into my diaper bag, that I decided something needed to be done. This was it. I had to spend $1500 to get my camera fixed and I was set on finding a sleeve for it that will protect it from the elements and my carelessness. I didn’t want a bulky case since I use my camera all the time and taking it in and out and I hate carrying an extra camera bag around, diaper bag is bulky enough. Camera coats are waterproof, hug the camera and give it just a tiny bit of padding. I love the product reviews 🙂 The toddler cup and cutlery seem like a good investment, thank you for reviewing. I would not spend $40+ on plates, though, but the design of the spoons and the cup seems like it is worth the price. OK, it is of course very personal, so sorry if I am being a drag, but $69 baby blanket…? Come on, it is dragged through the kitchen, the stairs, the garage, the parking lot, etc. Money is always an object with having babies – gotta save for things that really matter, like schooling 🙂 lol !!! I do have organic cotton blankets for the baby purchased from Gilt at a very reasonable price (thank you for Shi Shu introduction, I love it so much, I have given them as gifts) but no way a toddler is getting a polyester blanket for $69 bucks 🙂 I hope i am not setting my child up for years of therapy here… The camera cozy looks too funny. I know it is very useful, but it just cracks me up. I have always wondered just how dirty the park swings are too, but what the hell, they need to get their germs somewhere, right? There is not logic here whatsoever, since I do use a shopping cart cover (love it!). Toddler stuff is really amazing. And it will end up being almost cheaper because it doesn’t have to get replaced so often. Ok as far as a blanket, because Lexi isn’t attached to a toy/blanket, she doesn’t drag it through anything. It stays in her room. The price is steep. For most people. I mean I got it to review so I cannot judge that aspect but I do know that it’s the softest blanket I have ever roughed. By far. To those which it matter, the price might be fine. It’s really a luxurious blanket. You mentioned above ecoli on shopping cart handles- yikes! But then I am confused. In the photo in the post, the cover does not cover the shopping cart handle and you and Lexi are both holding the bare handle with your hands. I don’t use a shopping cart cover myself, but I always thought that the point of them was to protect from germs. If the most germy part of the cart is exposed and Lexi is touching it with her hands, then it isn’t protecting her from ecoli, right? Is there another point to shopping cart covers that I have missed? Yes! Haha I thought of that too. We always disinfect the handle really well but the inner parts can’t be disinfected as well because they are full of grooves. The shopping cart covers the handle too but Lex always pulls it down to hold onto the handlebar. I wanted to like the tummy stuffer, but alas, it’s imported from China, and we don’t do that in our house. I think that the Camera Coat is brilliant. So much better than lugging around a huge camera bag. Not sure why someone thinks it looks odd…. I just spent walking around Disney for two weeks and it was perfect for it. I could still toss it in the stroller storage or my bag without worrying about spillage. I have even more appreciation for it now. I love the nursing necklaces. I have been eyeing a few types to try as baby is WAY too distracted these days. I think these necklaces would help. I am so glad you mentioned the camera coats! I need one of those! do you by any chance know if the 2 red hens cart cover is flame retardant free and if it fits target carts?